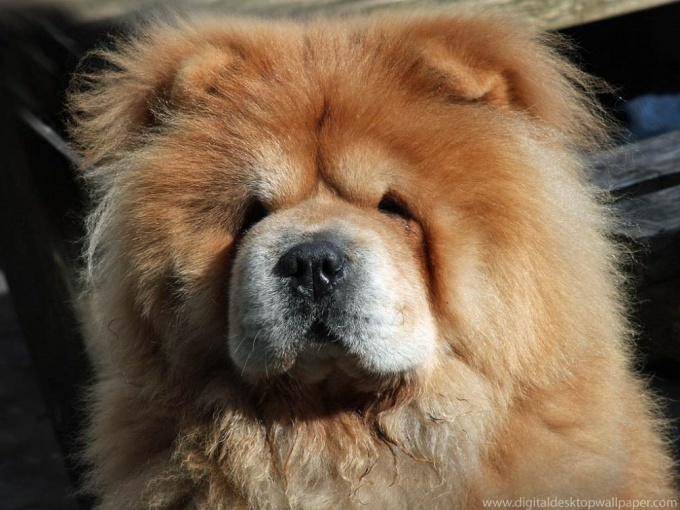 One of the oldest dog breeds, the Chow Chowwas bred in China. Its distinguishing feature is the thick fur and tongue blue. The dog gets along well in a city apartment and a country house, it is very clean and almost never barks. The only drawback of this breed is allergic to certain foods, so a proper diet to Chow – the guarantee of health. From the early days of Chow in your home to equip her for a place to eat and pick up in accordance with the growth of the stand under the bowl of food and water. This is the condition for the formation of correct posture and care – in a bowl on a stand is hard to get paws. If you use vitamin dry food for puppies or adult dogs need vitamin-mineral additional forage will not. Given the fact that the rocks are not strongly developed teeth, the dry food will need to soak. Standard diet – 60-70 grams of dry feed per 1 kilogram of dog's weight, but then focus on her appearance, which will be the main indicator. If you change the feed or if the dog takes any medication, make sure to see if she has an allergic reaction, if there were, then treat her "Tavegilum" rate of 0.01 milligrams per 1 kilogram of dog's weight. The interval of taking the drug – 12 hours, but just in case, consult your veterinarian. Rich wool Chow Chow in need of care. To keep it in beautiful, healthy condition and to improve the exchange of substances useful to pursue a course of methionine - 1 tablet 2 times a day - every spring and autumn. In any way do not give the dog salt, sweet, spicy, bitter and smoked. Forbidden pork, any fatty meat, chicken and game. Meat and vegetables – only cooked. Be careful with the carrots and cabbage – there is a lot of nitrates and the dog can get poisoned. Exclude from the diet flour and also bread, sausage, eggs, and seafood. Water should always be boiled and fresh. Meat - veal, beef can give a couple times a week, periodically replacing it with the boiled liver or fish without bones. Cheese can be given nekoboy and no more than 1-2 times a month for a small piece. When training when it is necessary to encourage the dog, you can give her unsalted fresh cookies "croquet". Once a week add her food with 1 tablespoon of bone meal. Mineral supplements and vitamins, let's Chow only after prior consultation with a specialist.